I couldn’t have asked for a better way to spend my first Sabbath morning as a volunteer teacher on the island of Yap. Sarah, a friend and fellow volunteer at the Yap Seventh-day Adventist School, wanted to visit a little church where she had occasionally worshipped the previous school year. “It’s unlike any church that you’ve ever seen in the United States,” she explained, whetting my appetite for cultural adventure. “It’s a tiny one-room tin house tucked away in a jungle village.” When she asked Nallely, our fourth grade teacher, and me whether we wanted to join her, we jumped at the opportunity. Early Sabbath morning, Sarah, Nallely, and I eagerly climbed into the little green car that had been made available for volunteers and were soon bumping along the road, dodging potholes and chatting happily. It wasn’t long before the wide, paved road turned into a narrow, dirt one. Surrounded by lush, towering vegetation, we drove leisurely through small villages dotted with tin homes. The fresh morning air smelled of wood smoke and breakfast. Children chased each other, laughing, in the dew-soaked grass. And chickens, seemingly unconcerned for their lives, pecked in the dirt mere inches from our tires. Sometimes we caught glimpses of the shimmering ocean through the trees. It was a perfect morning . . . except for one thing. We couldn’t find the church. We drove along the long, winding road once. Then twice. Were we in the wrong area? That seemed unlikely. Not only had Sarah visited the church before, she had asked someone for detailed directions the night before in case memory failed her. Finally, after we had driven the same stretch of road three times, we decided to give up our search and move on to plan B. Sarah drove a few more minutes and then turned into a driveway and got out of the car. Nallely and I followed her, curiously, as she walked past a house toward a small koyang, or outside meeting house. Within a few moments, a woman emerged with a radiant smile and ran to greet Sarah. We learned that her name was Mary and that Sarah had met her at the beginning of the previous school year. Mary lives in the jungle with her husband and son. She is soft spoken, gentle, and kind. In fact, she had skillfully hand woven beautiful traditional skirts for last year’s volunteer missionaries. Mary loves Jesus. She wanted to attend the Seventh-day Adventist church last year, but her alcoholic husband had no interest. Out of respect for him, Mary never went. All last year, Sarah and the other school staff prayed for Mary’s husband. And all year long, he didn’t change. Sarah had returned to the United States for the summer, so she hadn’t seen Mary for several months. In the comfortable shade of the koyang, Nallely and I listened intently as the two friends caught up with each other’s lives. When we stood to leave, Mary turned to Sarah and said, “I’m so happy you came. I’ve wanted to talk to you. My husband asked me this summer, ‘When is Sarah coming back?’ And, then he told me that when you returned, he wanted to go to your church!’” I looked at Sarah and could see the shock and joy in her eyes. Sarah asked Mary whether she wanted to come to church next Sabbath. “Yes,” she replied. Then Sarah asked her whether she wanted to have a weekly Bible study. “Yes!” came her thrilling response. On our drive back to the school, I looked up at the cloudless sky and thought, We couldn’t find a church that had been found many times before, but we visited a friend whose family was choosing to be truly found for the first time. I’ll never forget our Sabbath miracle. 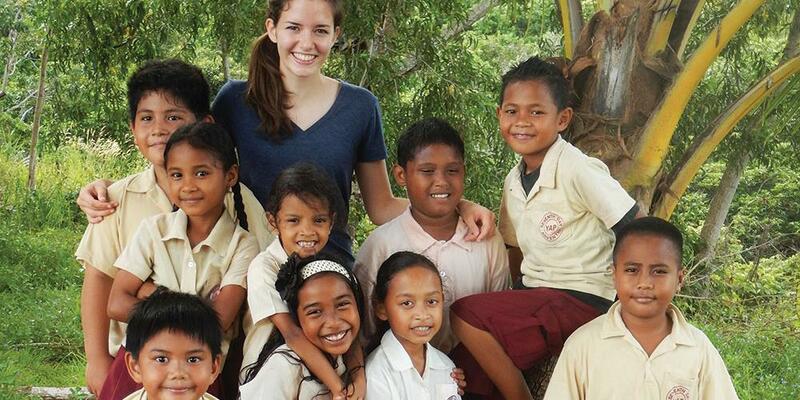 Originally from Portland, Oregon, Joanna Stephan served as a volunteer third grade teacher at the Seventh-day Adventist school on Yap, an island of the Federated States of Micronesia. She is studying nursing and graphic design at Walla Walla University in Washington.